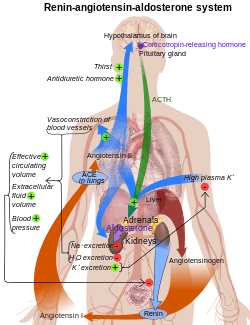 The renin–angiotensin system (RAS) or the renin–angiotensin–aldosterone system (RAAS) is a hormone system that is involved in the regulation of the plasma sodium concentration and arterial blood pressure. When the plasma sodium concentration is lower than normal or the renal blood flow is reduced, the juxtaglomerular cells in the kidneys convert prorenin (an intracellular protein) into renin, which is then secreted directly into the circulation. Plasma renin then cuts a short, 10 amino acid long, peptide off a plasma protein known as angiotensinogen. The short peptide is known as angiotensin I. Angiotensin I is then converted, by the removal of 2 amino acids, to form an octapeptide known as angiotensin II, by the enzyme angiotensin-converting enzyme (ACE) found in the lung capillaries. Angiotensin II is a potent vaso-active peptide that causes arterioles to constrict, resulting in increased arterial blood pressure. 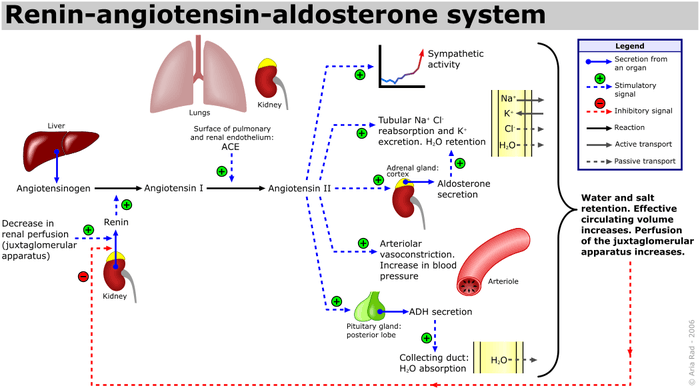 Angiotensin II also stimulates the secretion of the hormone aldosterone from the adrenal cortex. Aldosterone causes the tubular epithelial cells of the kidneys to increase the reabsorption of sodium ions from the tubular fluid back into the blood, while at the same time causing them to excrete potassium ions into the tubular fluid which will become urine. If the RAAS is abnormally active, blood pressure will be too high. There are many drugs that interrupt different steps in this system to lower blood pressure. These drugs are one of the primary ways to control high blood pressure (hypertension), heart failure, kidney failure, and harmful effects of diabetes. The system can be activated when there is a loss of blood volume or a drop in blood pressure (such as in hemorrhage or dehydration). This loss of pressure is interpreted by baroreceptors in the carotid sinus. In alternative fashion, a decrease in the filtrate NaCl concentration and/or decreased filtrate flow rate will stimulate the macula densa to signal the juxtaglomerular cells to release renin. Renin cleaves a decapeptide from a plasma α-2-globulin called angiotensinogen. The 10 amino acid long peptide is known as angiotensin I.
Angiotensin I is then converted to angiotensin II by angiotensin-converting enzyme (ACE), which is thought to be found mainly in lung capillaries. One study in 1992 found ACE in all blood vessel endothelial cells. Angiotensin II is the major bioactive product of the renin-angiotensin system, binding to receptors on intraglomerular mesangial cells, causing these cells to contract along with the blood vessels surrounding them and causing the release of aldosterone from the zona glomerulosa in the adrenal cortex. Angiotensin II acts as an endocrine, autocrine/paracrine, and intracrine hormone. Throughout the body, it is a potent vasoconstrictor of arterioles. In the kidneys, AII constricts glomerular arterioles, having a greater effect on efferent arterioles than afferent. As with most other capillary beds in the body, the constriction of afferent arterioles increases the arteriolar resistance, raising systemic arterial blood pressure and decreasing the blood flow. However, the kidneys must continue to filter enough blood despite this drop in blood flow, necessitating mechanisms to keep glomerular blood pressure up. To do this, angiotensin II constricts efferent arterioles, which forces blood to build up in the glomerulus, increasing glomerular pressure. The glomerular filtration rate (GFR) is thus maintained, and blood filtration can continue despite lowered overall kidney blood flow. Because the filtration fraction has increased, there is less plasma fluid in the downstream peritubular capillaries. This in turn leads to a decreased hydrostatic pressure and increased oncotic pressure (due to unfiltered plasma proteins) in the peritubular capillaries. The effect of decreased hydrostatic pressure and increased oncotic pressure in the peritubular capillaries will facilitate increased reabsorption of tubular fluid. In the adrenal cortex, it acts to cause the release of aldosterone. Aldosterone acts on the tubules (e.g., the distal convoluted tubules and the cortical collecting ducts) in the kidneys, causing them to reabsorb more sodium from the urine. This conserves the body's sodium reserves, but a deficit can only be corrected by the ingestion of salt (NaCl) in the diet. In exchange for the reabsorbing of sodium to blood, potassium is secreted into the tubules, becomes part of urine and is excreted. Release of anti-diuretic hormone (ADH), also called vasopressin – ADH is made in the hypothalamus and released from the posterior pituitary gland. As its name suggests, it also exhibits vaso-constrictive properties, but its main course of action is to stimulate reabsorption of water in the kidneys. ADH also acts on the central nervous system to increase an individual's appetite for salt, and to stimulate the sensation of thirst. The prevention of sodium losses via the urine, and the correction of any deficit by consuming salt act together to increase blood pressure. These actions are opposed by atrial natriuretic peptide (ANP) which is secreted from the atria of the heart in response to stretch caused by an excessive blood volume. Locally expressed renin-angiotensin systems have been found in a number of tissues, including the kidneys, adrenal glands, the heart, vasculature and nervous system, and have a variety of functions, including local cardiovascular regulation, in association or independently of the systemic renin-angiotensin system, as well as non-cardiovascular functions. Outside the kidneys, renin is predominantly picked up from the circulation but may be secreted locally in some tissues; its precursor prorenin is highly expressed in tissues and more than half of circulating prorenin is of extrarenal origin, but its physiological role besides serving as precursor to renin is still unclear. Outside the liver, angiotensinogen is picked up from the circulation or expressed locally in some tissues; with renin they form angiotensin I, and locally expressed angiotensin-converting enzyme, chymase or other enzymes can transform it into angiotensin II. This process can be intracellular or interstitial. In the adrenal glands, it is likely involved in the paracrine regulation of aldosterone secretion, in the heart and vasculature, it may be involved in remodeling or vascular tone, and in the brain where it is largely independent of the circulatory RAS, it may be involved in local blood pressure regulation. In addition, both the central and peripheral nervous systems can use angiotensin for sympathetic neurotransmision. Other places of expression include the reproductive system, the skin and digestive organs. Medications aimed at the systemic system may affect the expression of those local systems, beneficially or adversely. In the fetus, the renin-angiotensin system is predominantly a sodium-losing system, as angiotensin II has little or no effect on aldosterone levels. Renin levels are high in the fetus, while angiotensin II levels are significantly lower; this is due to the limited pulmonary blood flow, preventing ACE (found predominantly in the pulmonary circulation) from having its maximum effect. Inhibitors of angiotensin-converting enzyme (ACE inhibitors) are often used to reduce the formation of the more potent angiotensin II. Captopril is an example of an ACE inhibitor. 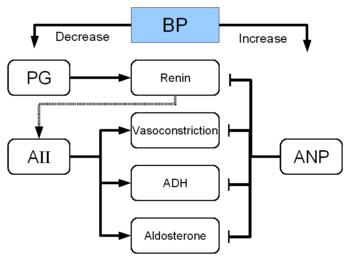 ACE cleaves a number of other peptides, and in this capacity is an important regulator of the kinin–kallikrein system, as such blocking ACE can lead to side effects. Angiotensin receptor blockers (ARBs) can be used to prevent angiotensin II from acting on angiotensin receptors. ↑ Boron, Walter F. (2003). "Integration of Salt and Water Balance (pp. 866–7); The Adrenal Gland (p. 1059)". Medical Physiology: A Cellular And Molecular Approaoch. Elsevier/Saunders. ISBN 1-4160-2328-3. ↑ Kumar, Abbas; Fausto, Aster (2010). "11". Pathologic Basis of Disease (8th ed.). Saunders Elsevier. p. 493. ISBN 978-1-4160-3121-5. 1 2 3 Yee AH, Burns JD, Wijdicks EF (April 2010). "Cerebral salt wasting: pathophysiology, diagnosis, and treatment". Neurosurg Clin N Am. 21 (2): 339–52. doi:10.1016/j.nec.2009.10.011. PMID 20380974. ↑ "High Blood Pressure: Heart and Blood Vessel Disorders". Merck Manual Home Edition. ↑ Solomon, Scott D; Anavekar, Nagesh (2005). "A Brief Overview of Inhibition of the Renin-Angiotensin System: Emphasis on Blockade of the Angiotensin II Type-1 Receptor". Medscape Cardiology. 9 (2). ↑ "Renin Angiotensin Aldosterone System - Mechanism - Check123, Video Encyclopedia". Check123 - Video Encyclopedia. Retrieved 2016-09-12. 1 2 3 4 5 Paul M, Poyan Mehr A, Kreutz R (July 2006). 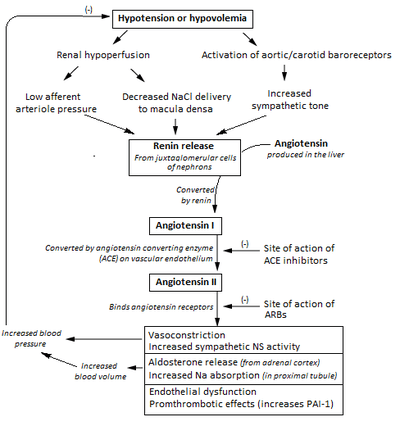 "Physiology of local renin-angiotensin systems". Physiol. Rev. 86 (3): 747–803. doi:10.1152/physrev.00036.2005. PMID 16816138. ↑ Rogerson FM, Chai SY, Schlawe I, Murray WK, Marley PD, Mendelsohn FA (July 1992). "Presence of angiotensin converting enzyme in the adventitia of large blood vessels". J. Hypertens. 10 (7): 615–20. doi:10.1097/00004872-199207000-00003. PMID 1321187. ↑ Kobori, H.; Nangaku, M.; Navar, L. G.; Nishiyama, A. (1 September 2007). "The Intrarenal Renin-Angiotensin System: From Physiology to the Pathobiology of Hypertension and Kidney Disease". Pharmacological Reviews. 59 (3): 251–287. doi:10.1124/pr.59.3.3. PMID 17878513. 1 2 Ehrhart-Bornstein, M; Hinson, JP; Bornstein, SR; Scherbaum, WA; Vinson, GP (April 1998). "Intraadrenal interactions in the regulation of adrenocortical steroidogenesis" (PDF). Endocrine Reviews. 19 (2): 101–43. doi:10.1210/edrv.19.2.0326. PMID 9570034. 1 2 Nguyen, G (March 2011). "Renin, (pro)renin and receptor: an update". Clinical science (London, England : 1979). 120 (5): 169–78. doi:10.1042/CS20100432. PMID 21087212. ↑ Kumar, R; Singh, VP; Baker, KM (March 2008). "The intracellular renin-angiotensin system: implications in cardiovascular remodeling". Current opinion in nephrology and hypertension. 17 (2): 168–73. doi:10.1097/MNH.0b013e3282f521a8. PMID 18277150. ↑ Kumar, R; Singh, VP; Baker, KM (April 2009). "The intracellular renin-angiotensin system in the heart". Current hypertension reports. 11 (2): 104–10. doi:10.1007/s11906-009-0020-y. PMID 19278599. ↑ McKinley, MJ; Albiston, AL; Allen, AM; Mathai, ML; May, CN; McAllen, RM; Oldfield, BJ; Mendelsohn, FA; Chai, SY (June 2003). "The brain renin-angiotensin system: location and physiological roles". The international journal of biochemistry & cell biology. 35 (6): 901–18. doi:10.1016/S1357-2725(02)00306-0. PMID 12676175. ↑ Patil J, Heiniger E, Schaffner T, Mühlemann O, Imboden H (April 2008). "Angiotensinergic neurons in sympathetic coeliac ganglia innervating rat and human mesenteric resistance blood vessels". Regul. Pept. 147 (1–3): 82–7. doi:10.1016/j.regpep.2008.01.006. PMID 18308407. ↑ Gradman A, Schmieder R, Lins R, Nussberger J, Chiangs Y, Bedigian M (2005). "Aliskiren, a novel orally effective renin inhibitor, provides dose-dependent antihypertensive efficacy and placebo-like tolerability in hypertensive patients". Circulation. 111 (8): 1012–8. doi:10.1161/01.CIR.0000156466.02908.ED. PMID 15723979. ↑ Richter WF, Whitby BR, Chou RC (1996). "Distribution of remikiren, a potent orally active inhibitor of human renin, in laboratory animals". Xenobiotica. 26 (3): 243–54. doi:10.3109/00498259609046705. PMID 8730917. ↑ Tissot AC, Maurer P, Nussberger J, Sabat R, Pfister T, Ignatenko S, Volk HD, Stocker H, Müller P, Jennings GT, Wagner F, Bachmann MF (March 2008). "Effect of immunisation against angiotensin II with CYT006-AngQb on ambulatory blood pressure: a double-blind, randomised, placebo-controlled phase IIa study". Lancet. 371 (9615): 821–7. doi:10.1016/S0140-6736(08)60381-5. PMID 18328929. ↑ Brown, MJ (2009). "Success and failure of vaccines against renin-angiotensin system components". Nature reviews. Cardiology. 6 (10): 639–47. doi:10.1038/nrcardio.2009.156. PMID 19707182.